Producer Reynold D’Silva said: "The idea of a Beatles in India documentary has been with me since the mid-nineties. By pure coincidence, or perhaps it was fate, three separate people put me in touch with Paul (Saltzman) early last year. It turned out he had been harbouring the idea for even longer than I had! After our first phone call, we were set on a path to produce the film together. Paul has a stellar track record in his field of producing and directing films. 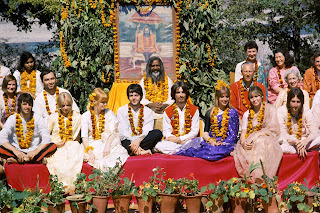 He has a clear vision with a profound knowledge of the subject matter borne out by the fact he was at the ashram in Rishikesh with The Beatles in February, 1968." THE BEATLES IN INDIA, directed by two time Emmy award winning producer-director, Paul Saltzman and produced by Paul Saltzman & Reynold D'Silva for Sunrise Films, Ren/oir Pictures & Silva Screen is set to be released worldwide in Autumn 2018.